Among several things that make Bhutan unique is its art and architecture. They reflect the Bhutanese civilization and its core values. The much of the country’s art and architecture form an important element of the national heritage. 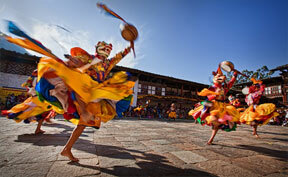 Bhutan’s thirteen traditional arts and crafts (Zorig Chusum) is a legacy from the 17th century masters. They include: Woodwork (Shing Zo), Stonework (Dho Zo), Carving (Par Zo), Painting (Lha Zo), Sculpting (Jim Zo), Casting (Lug Zo), Wood Turning (Shag Zo), Blacksmithy (Gar Zo), Ornament Making (Troe Ko), Bamboo Work (Tsha Zo), Paper Making (De Zo), Tailoring and Embroidery (Tshem Zo), and Weaving (Thag Zo). The Institutes of Zorig Chusum, in Thimphu and Trashiyangtse, promote the country’s arts and crafts. The two institutes play a pivotal role in propagating the country’s traditional arts and crafts. Several cottage industries located around the country also engage in specific arts or crafts. Despite the imminent threat from the forces of globalization and liberal trade, the government of Bhutan has helped preserve these arts and crafts through various national initiatives. For example, Zhemgang, in central Bhutan, is the main producer of bamboo products. Similarly, Trashiyangtse in the east produces paper and wooden bowls. Bumthang is known for its vegetable dyed wool textile called yathra, and Lhuentse for its pure silk weaving called kishuthara. And Thangka painting is almost a divine art with strict geometric proportions. Further, the government recently established an agency responsible for promoting indigenous arts and crafts. The agency looks after small cottage industries engaged in producing traditional handicrafts. It ensures the products find appropriate markets, both at home and abroad. Arts and crafts continue to remain a major source of cash income for the farmers of Bhutan.